Arlington, VA – There is no greater honor in lacrosse than representing a country of your heritage on the international stage. The goal of the Women’s National Team staff is to ensure that all the players selected to the team get the opportunity to fulfill this dream. 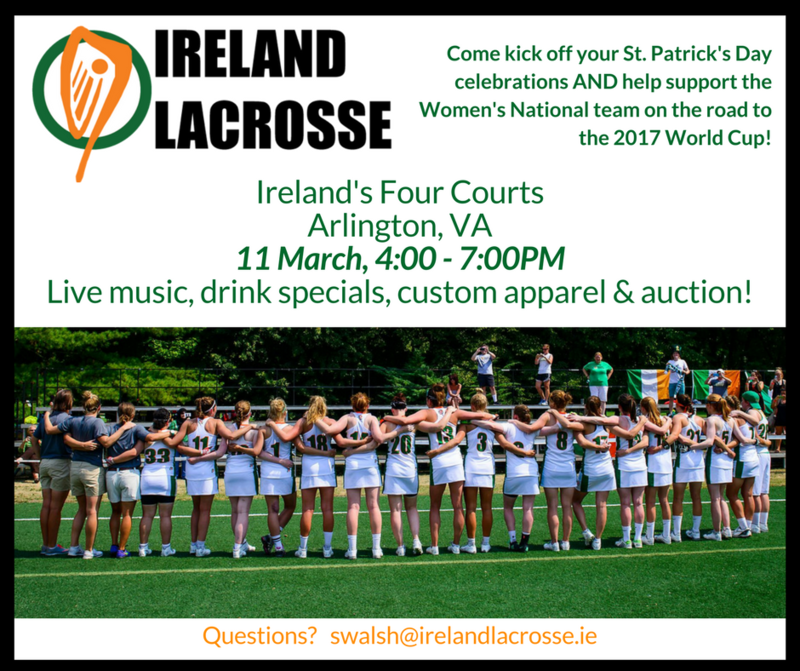 Please read the following message from Head Coach Sarah Walsh, regarding the party benefitting the Women’s programme at Ireland’s Four Courts in Arlington, VA on 11 March (flyer below). “The World Cup is being held in Surrey, England and is significantly more expensive than in years past. It will cost each player a minimum of $2500 to participate in our one week training camp and the two week tournament this upcoming July. The cost is prohibitive for many of the players, especially ones pursuing a higher level of education. Please help us give these players the opportunity to compete in Surrey this July A strong showing by the Irish Women’s team will give us a solid foundation to build a more extensive program in Ireland. Eventually, we want to see women’s lacrosse thrive in Ireland as it does in the United States and grow the game internationally. Your help can start us down that path. Unable to make it, but want to help? Click here to contribute to the Women’s National Team fundraising efforts!